THE Indian Air Force on Monday released radar images as part of its “irrefutable evidence” to assert that it shot down an F-16 fighter jet of Pakistan during the February 27 aerial combat over Nowshera in Jammu and Kashmir. Graphic captures from an airborne warning and control system (AWACS) were shown by the IAF at a media briefing, reiterating that it has credible evidence that Pakistan Air Force (PAF) lost an F-16 fighter jet in the aerial engagement. The IAF had issued a similar statement on Friday asserting that it shot down an F-16 in Nowshera sector after leading American magazine ‘Foreign Policy’ reported that a US count of the F-16s with Pakistan has found that none of them are missing. Government has been maintaining that IAF pilot Abhinandan Varthaman had engaged with one of the Pakistani F-16s and shot it down before his Mig-21 Bison was downed, but Pakistan has denied losing any aircraft in the combat. Varthaman was captured by Pakistan and was released after spending nearly 60 hours in Pakistani custody. 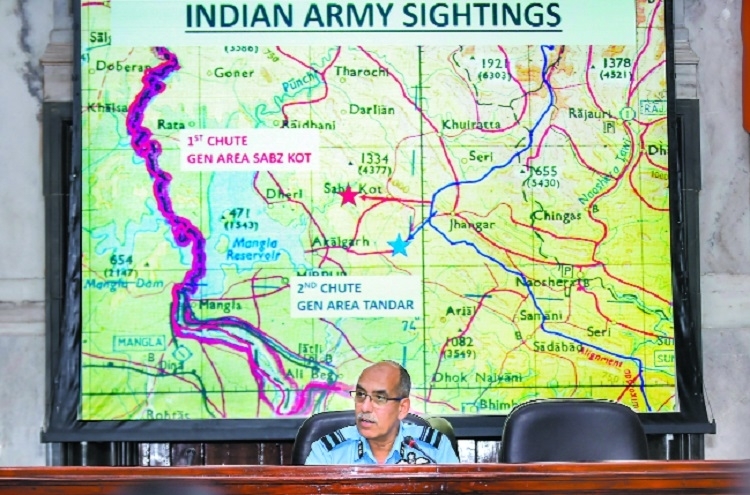 “The IAF has irrefutable evidence of not only the fact that F-16 was used by Pakistan Air Force on February 27, but also that an IAF Mig 21 Bison shot down a Pakistan Air Force F-16,” Air Vice Marshal RGK Kapoor, the Assistant Chief of Air Staff (Operations and Space) said in a statement at the briefing. He, however, did not take any question on the issue. The IAF official said the Pakistan Air Force fired multiple AMRAAM missiles which were defeated by use of counter measures and tactical maneuvers. “In the aerial combat that followed one MiG 21 Bison of the IAF piloted by Wing Commander Abhinandan shot down one F-16 of PAF as shown in radar image on the slide. “The F-16 crashed and fell across the LoC in Pakistan-occupied Jammu and Kashmir. The IAF lost one MiG21 in the aerial engagement and Abhinandan ejected safely but his parachute drifted into Pakistan Occupied J and K,” said the Air Vice Marshal. Following the report in Foreign Policy, Pakistani Prime Minister Imran Khan had accused the BJP for “whipping up war hysteria” and targeted the party over India’s assertion that the IAF shot down a Pakistani F-16. “There is no doubt that two aircraft went down in the aerial engagement on February 27, one of which was a Bison of IAF while the other was an F-16 of PAF conclusively identified by its electronic signature and radio transcripts,” the IAF official said. He said the IAF has more credible information and evidence that is clearly indicative of the fact that PAF has lost one F-16 in the air action on February 27. “However, due to security and confidentiality concerns, we are restricting the information being shared in the public domain.” The IAF showed images of the F-16 and JF 17 jets engaging with Indian fighters and how signal of the one F-16 dropped of from the radar. “Analysis of electronic emissions have shown that the aircraft picked up the intercepts from air-borne radars and radio transcripts indicated F-16s in the area directly in front of Wing Commander Abhinandan’s aircraft,” Air Vice Marshal Kapoor said. He said the PAF was unable to achieve its military objectives during the engagement. The official said the Indian Army posts in the vicinity of the LoC in Jhangar sector have visually sighted two separate parachutes. “The first sighting was in West, in general area Sabzkot and the second was after a few minutes in Southwest general area Tandar,” he said. Last week, leading American magazine ‘Foreign Policy’ reported that a US count of the F-16s with Pakistan has found that none of them are missing, contradicting India’s claim that one of its fighter jets shot down a Pakistani F-16 during the aerial dogfight on February 27. In the report, the magazine said two senior US defense officials with direct knowledge of the situation told it that American personnel recently counted Islamabad’s F-16s and found none of the planes missing. The report contradicted the claim made by New Delhi that the IAF shot down an F-16 jet of Pakistan. The Indian Air Force on February 28 displayed pieces of an AMRAAM missile, fired by a Pakistani F-16, as evidence to “conclusively” prove that Pakistan deployed US-manufactured F-16 fighter jets during an aerial raid targeting Indian military installations in Kashmir. Indian Air Force has been forcefully asserting that it shot down a Pakistani F-16 during the dogfight. Pakistan has denied that it lost any F-16 jet during the aerial combat.